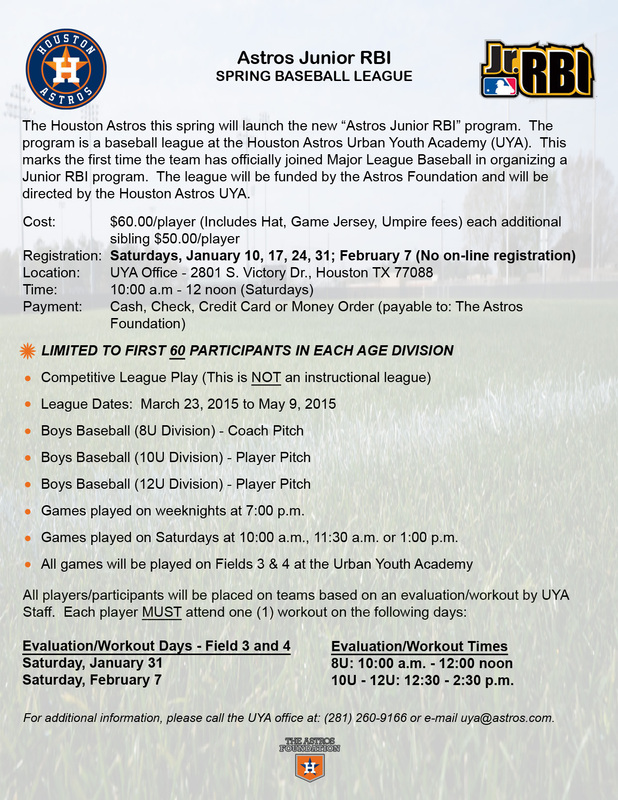 The Houston Astros, Astros Foundation, MLB and the Astros UYA Staff are excited to announce the expansion of the RBI programming at the UYA…… in the spring of 2015 we will begin the “Astros JrRBI Program”. This will also be the first time the Astros have chartered a JrRBI Program as well. The new Astros JrRBI will be directed exclusively by the Houston Astros UYA Staff. The program will provide an affordable opportunity for boys and girls between the ages of 7-12 to play competitively while continuously and positively learning the game of baseball and softball. Prior to 2015, the local JrRBI Program was directed by an independent group (St. Monica JrRBI). The Houston Astros and the Urban Youth Academy would like to thank the St. Monica Youth Sports Ministry, its staff and volunteers for their many years of dedication to youth, baseball and the community. The goal of the Astros RBI/JrRBI Program is to increase participation and interest in baseball; develop the players self-esteem; motivate athletes to study more effectively; provide participants with a strong incentive to stay in school; provide communities with the opportunity to become actively involved with the kids; develop talented athletes for future participation in high school, college and perhaps beyond. 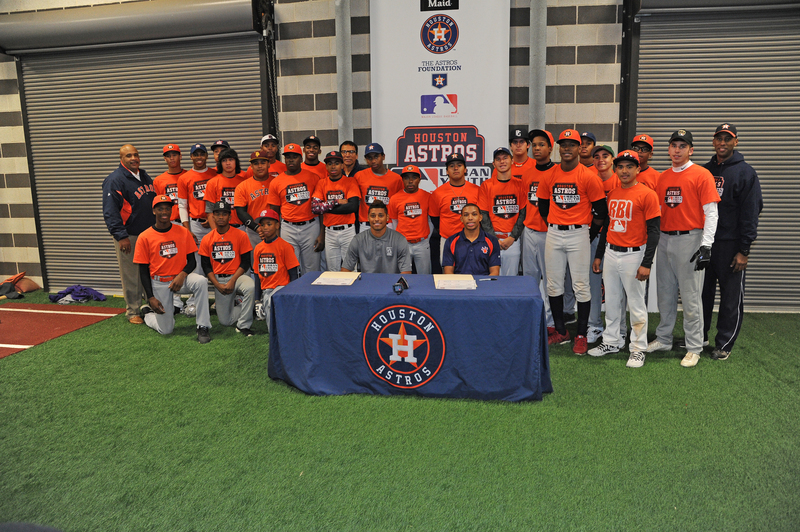 Pablo Salazar and Evian Benjamin, both currently seniors in high school, are two members of the Houston Astros Urban Youth Academy to be offered college baseball scholarships. Salazar, a shortstop and right-handed pitcher, has been offered a scholarship by the University of Arkansas at Little Rock, and Benjamin, a centerfielder, received his offer from Sam Houston State. Salazar, who has been a member of the UYA since it opened in 2010, currently attends Lutheran South Academy, while Benjamin attends Episcopal High School. Salazar and Benjamin took part in a special signing event on Tuesday, Dec. 2 at 6:30 p.m. at the Academy, which is located in Sylvester Turner Park on 2801 S Victory Dr., Houston, TX 77088 in Acres Homes. The event also included a workout of several young ballplayers from the Academy.